The colors which are used in a company’s logo or other interface design have a major impact on how the company (brand) is viewed as a whole. Color reference guides (like Pantone) and Adobe color tools make it fast and easy to select colors. But they don’t always translate well into the final production process. You have to consider the printing technology, the type of ink, and the final substrate which will be used. With membrane switches and graphic overlays, Almax-RP uses a powerful UV inkjet printer and prints mostly on polyester substrates. We also use screen printing for some graphic overlays. We almost always print a white background on our overlays, even if digitally printed, because it makes the colors of the graphic pop out more, especially anything white like text or logos. Our printing is high quality across a wide range of polyester materials for prototyping, control panel overlays, and small to medium lot production of overlays and graphics for membrane switches. Selecting the right colors for graphic overlays, logos, websites and the company brand is important for helping create the right message and for capturing the user’s attention in the best way. Color strikes people in different ways but there are some basic principles which can help you think about color when designing an interface or graphic label. One interesting finding from researchers is that emotion plays a role in how we view different colors. See the graphic above for some basic relationships between color and emotion. We can generalize about certain colors like saying brown is associated with ruggedness and durability and red helps generate excitement. Blue gives a feeling of trust and strength. Yellow can reflect optimism. Color affects our emotions and thoughts. In a study called Impact of Color in Marketing, researchers discovered that around 90% of judgments made about products can be based just on the color alone. This is amazing really! “The specific colors used in a company’s logo have a significant impact on how that logo, and the brand as a whole, is viewed by consumers,” according to a study at the University of Missouri-Columbia. 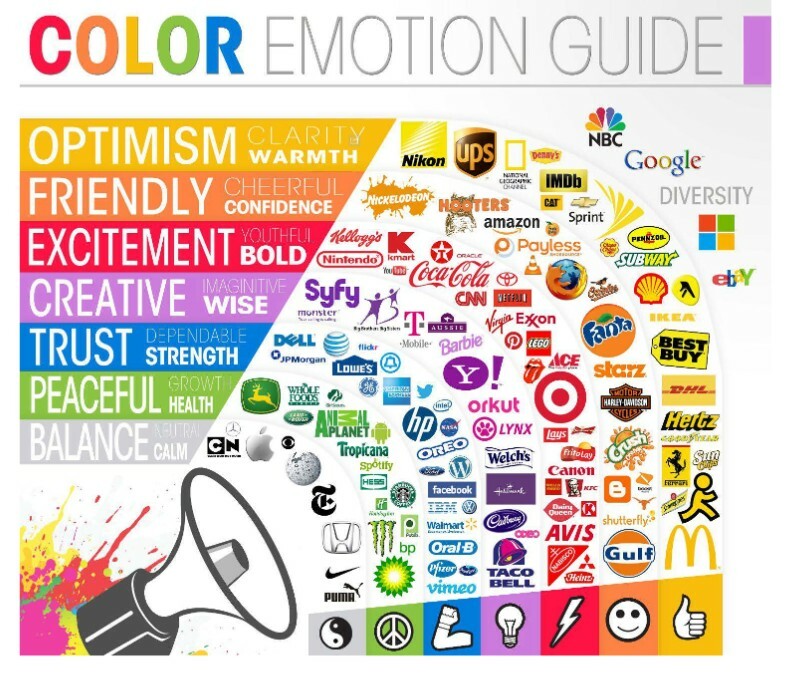 Color plays a significant role in branding. What’s important is the perceived appropriateness of the color being used for a particular brand. A study called Exciting Red and Competent Blue said that buying intent is affected by color. Colors effectively influence how buyers view the brand itself. Our brains like to recognize brands so using the right colors is vitally important to create brand identity and awareness. A newer brand might be able to stand out by using logo and design colors that are different from existing competitors. Sometimes, being different is the right thing to do. Other times, being the same works better. How are companies and designers using color in logos and marketing material to stand out from the competition? Some have stuck with traditional conservative color theory, and others have thought more creatively about how to best use colors to create brand loyalty and also user effectiveness. Red is the longest wavelength and is very powerful. It grabs the attention of the user and is associated with certain actions like stop or warning. Orange is a combination of red and yellow and is stimulating. It can create a physical and emotional reaction in people. White is totally reflective. It is uncompromising, clear, and sterile. It can be very effective for text on the graphic design. Green represents harmony and balance. It is a restful color on the eye. It is in the center of the color spectrum. Violet or purple is the shortest wavelength. It can take your awareness to a higher level, even into the realms of spiritual. It communicates quality. Don’t overdo it with purple, though, or it can give a sense of being cheap. Blue is very soothing and gives a more mental reaction than red, which causes a more physical reaction. Soft blues can calm the mind and help with focus and concentration. Blue is also a color of communication. Used in the wrong way, it can come across as unemotional or unfriendly. Grey is a neutral color but it also can be the absence of color. It can have a depressive effect so be careful when using it. Greys are also the hardest to match for graphic overlay production and prototypes. Almax-RP has a screen printed silver which looks great on overlays and this can be a great option for certain parts. Black is the absence of light because no wavelengths are reflected. It can be threatening. People can be afraid of the dark. But it also communicates clarity and excellence, and seriousness. It works really well in combination with white.